The Juvabrite product is made by Solvaderm and designed to help reduce the appearance of age spots and discolouration in the skin. This can be caused by a number of things, from age and sun exposure to pregnancy and acne scarring, but is hard to get rid of. There are several products on the market that contain harsh ingredients which claim to help but can damage the skin. Instead, Juvabrite works gently with natural substances to brighten the skin while also improving tone and texture. The Solvaderm website, which is where the product is sold, is very informative and offers the consumer free online consultations and other skincare advice. Juvabrite costs $69.99 per bottle of 30ml and there is a 60-day money back guarantee. In addition to this, Solvaderm provides a 10% discount to consumers who ‘like’ them on social media. The ingredients used in Juvabrite are a blend of natural extracts that brighten the skin, fading the appearance of discolouration dramatically over a period of 12 weeks. The formula is said to be professional strength that is ‘transformative’ and that can be used by people of all ages and skin types. While the ingredients are all listed on the website, none are actually explained in detail. Among the key active substances are Seaweed extract, Hyaluronic Acid, Peppermint extract, Mallow extract, Primula extract and Balm Mint. The formula is a proprietary blend and in addition to the brightening affects, will also moisturize and smooth the texture of the skin. 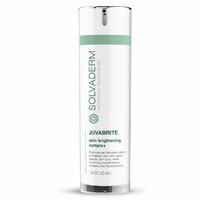 Juvabrite should be applied in a thin layer to affected areas or, if needed, all over the facial area after cleansing. It can be worn alone or under make-up and the manufacturer advises that it is accompanied by the use of a sunscreen to prevent more sun damage from occurring. It would be helpful if the Solvaderm company provided more explanation as to how the ingredients used in this product worked rather than just listing them. It certainly contains an impressive amount of natural substances which will produce significant results in just a few months. Although it is a more expensive brand of skin brightener on the market, the fact that it is used by professional skincare experts is a good sign and it does indeed have a solid money back guarantee.